This entry was posted in Community, Events and tagged forestry and wildlife sciences, Solon Dixon on June 8, 2012 by Wire Eagle. 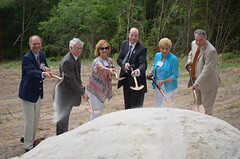 AUBURN – Auburn University broke ground June 6 on the Solon and Martha Dixon Foundation Learning Center in Andalusia. The $1.6 million facility will feature a 100-seat auditorium and 40-seat classroom addition to the Solon Dixon Forestry Education Center, which is used for teaching, research and outreach by the School of Forestry and Wildlife Sciences. This entry was posted in General News and tagged carbon, forestry and wildlife sciences on June 8, 2012 by Wire Eagle. AUBURN – In a paper published recently in the journal Ecosystems, a team led by Auburn University School of Forestry and Wildlife Sciences researchers found that the southeast region of the United States could be close to a turning point in terms of its carbon footprint. “What makes the findings so important and relevant to policy, says Hanqin Tian, lead author of the study, is that it is the first study to look at multiple factors affecting regional climate and carbon storage over an extended period of time. 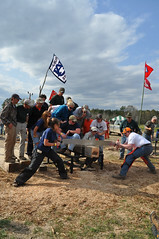 This entry was posted in Community, General News, Research and tagged forest, forestry and wildlife sciences, nursery on February 16, 2012 by Wire Eagle. AUBURN – The Southern Forest Nursery Management Cooperative started by the Auburn University Department of Forestry is celebrating 40 years of conducting groundbreaking research and providing information to forest-tree nurseries across the southern United States. Cooperative research on seedling care and pesticides has helped nursery owners to create ideal growing conditions, thus improving the health and quantity of seedlings – adding to owners’ income, increasing the amount of land reforested and expanding the industry.